Do you need an extra boost in your game of PVP? Do you feel unapologetic to creepers? If you enjoy feeling like a madman, then this build is for you. After all, the only thing better than explosives, is a device that shoots explosives. As I'm sure you know, TNT is dangerous stuff. The destructive properties of an activated TNT block depends on the blocks it is activated near. The blast resistance of each block type will determine the TNT's destructive force. Air has the weakest blast resistance and obsidian the strongest. When activated near water, or any other liquid, the effectiveness of TNT's explosion will be limited greatly as well, most often negating any explosiveness. Later on, you will notice that our cannon uses a base of water beneath the TNT charge and this is why. Without the water base, our cannon would explode and that's not the effect we're looking for. The main principle with which our cannon operates is that of the "TNT charge". What is TNT charge? 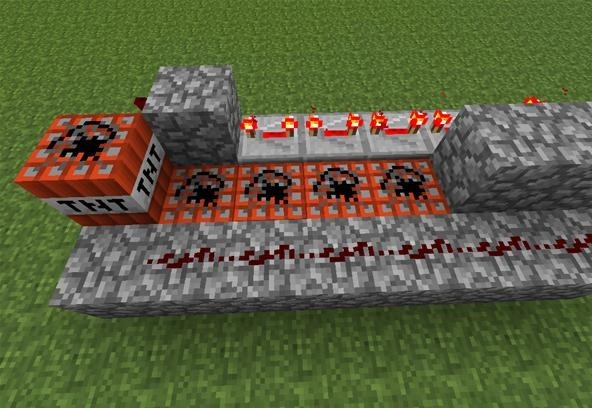 Well, when two or more TNT blocks are set next to a second set of TNT blocks the set that is first activated enters a charged state and propels the second set as it explodes. Typically this will occur in random, unpredictable directions. 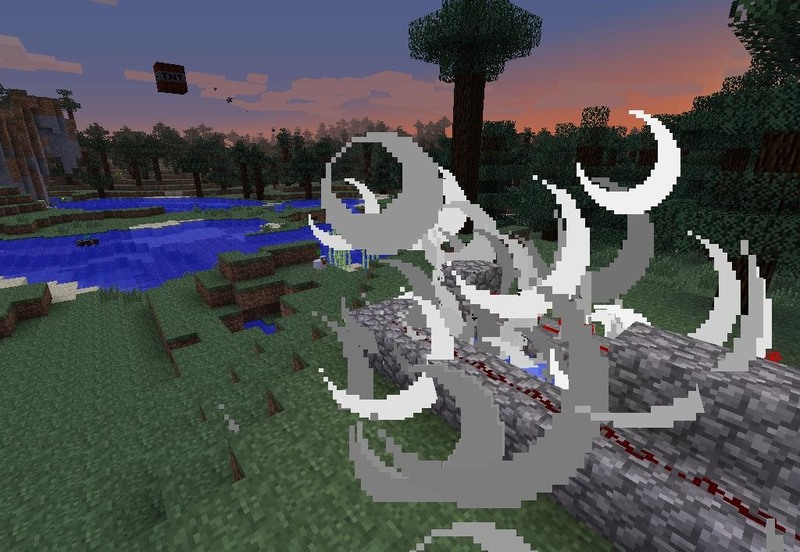 A fun way to see this effect is by simply placing a bunch of TNT down and observing how it behaves when activated. You will see that while some blocks simply explode, others are sent flying wildly. This is exactly the effect we're looking for in our cannon, only it is a charged explosion that is directed in a specific direction without the randomness of a grouped explosion. For our purposes, we'll use the simplest cannon build, so that you can see the principles at work, replicate them, and make variations. Start by placing cobblestone blocks in a rectangular shape, seven blocks long and three blocks wide. Empty a water bucket on one end of the inside of the cobblestone box. 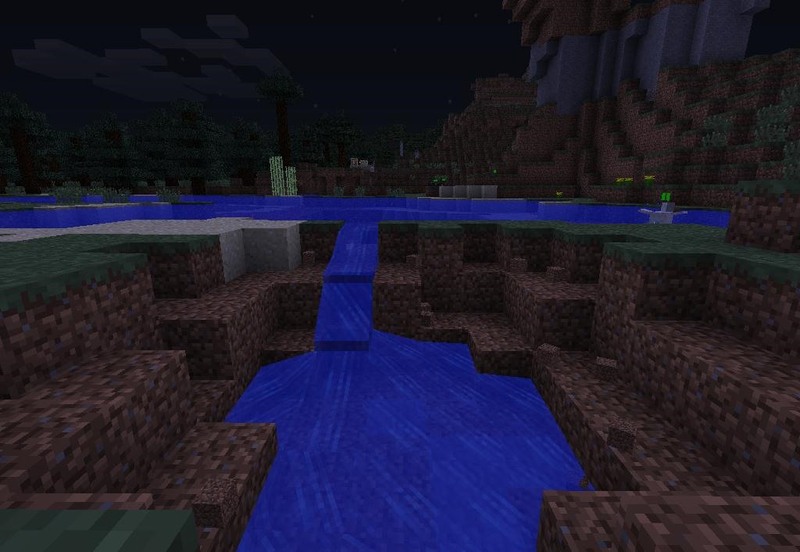 The direction this water flows is the direction we will be aiming our TNT. 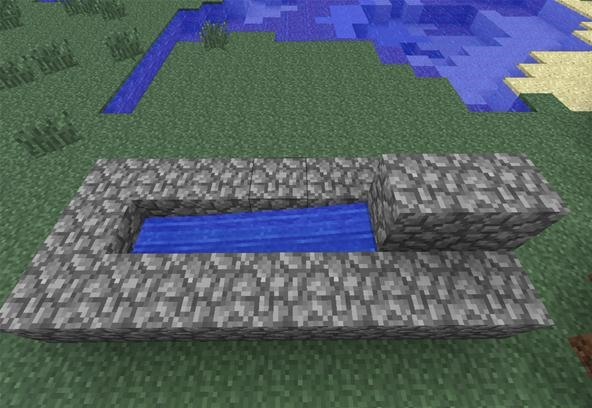 In the case of the picture below, the water is flowing from right to left and as such, our TNT will be shooting right to left. 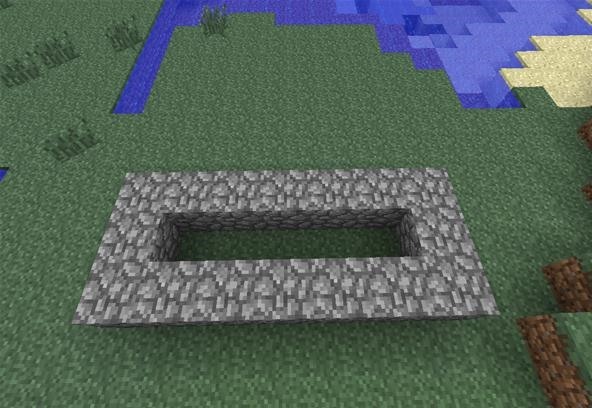 Finally, place two cobblestone blocks on the safe end of your rectangle. One of these blocks will be on top of the water source—it must not block it. Now that your frame is complete, place a button or lever on the far side of the cannon as seen below. Run redstone wire down one side of the canon, from the safe side to one block short of the business end. 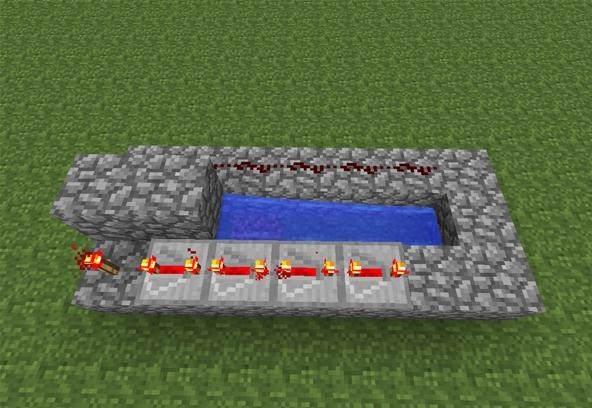 Now place a redstone torch on the opposite side of the redstone side of your canon, followed by four redstone repeaters. Left click the repeaters until they are in their most open position or longest timing. 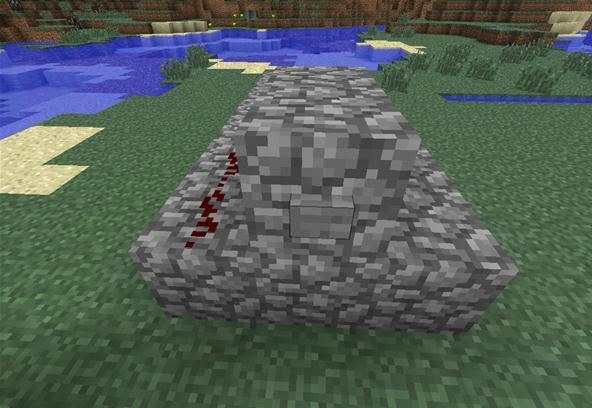 Place another block at the end of your line of repeaters with a redstone torch on its side. Now it's time to get down to business. 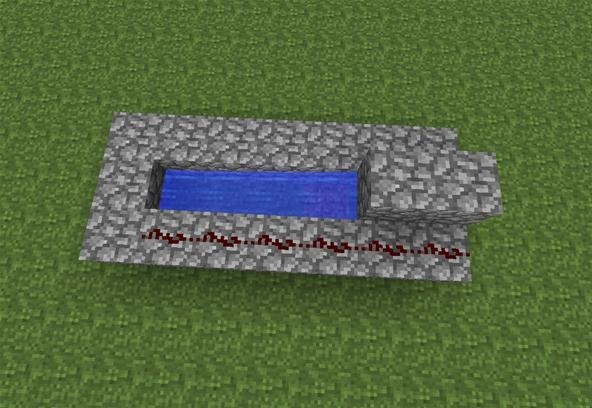 Place four blocks of TNT in the water trench and a final block of TNT on top of the cobblestone block at the end of your row of TNT. Your cannon should now look exactly as mine does below. Now it's time to get down to business. To activate your cannon, press your lever or button. If you are in survival mode, step far back. The result should be something exciting either way. In the image above, I have just activated my canon. The darkened row of TNT has just been activated and as you can see, current is moving up repeaters on the far side to the final block of TNT. Our cannon is calibrated carefully to activate the final TNT just after the row of charges have been blown—this is so that the final TNT block will be activated just on time. If it were activated too soon or too late, it will explode, taking your cannon with it. The cannon works using the principle that TNT charges, as explained earlier. The row of four TNT blocks is the charge. These will explode, but will not destroy your cannon as long as there is water beneath it. As they explode, these TNT blocks will lend their power to the final block of TNT sending it through the air on a four second timer. (1) Here the charge is activated just before the final TNT block is. (2) The TNT charge explodes but does not destroy our cannon, thanks to the water that quickly runs beneath it. You can see the final TNT block being propelled now. (3) With cannon intact, the powered up TNT is about to explode!, (4) Here is the damage done from about 30 blocks away. 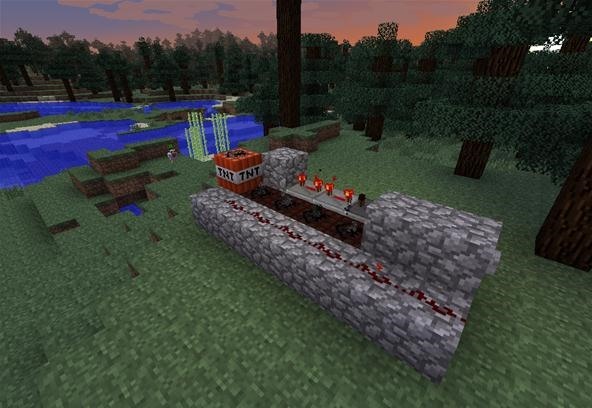 This TNT cannon was about as simple as they come, but it doesn't have to end there. As long as you follow the principles of charging your final TNT block and are sure to time the final block to go off just as the charge is activated, the possibilities are endless. 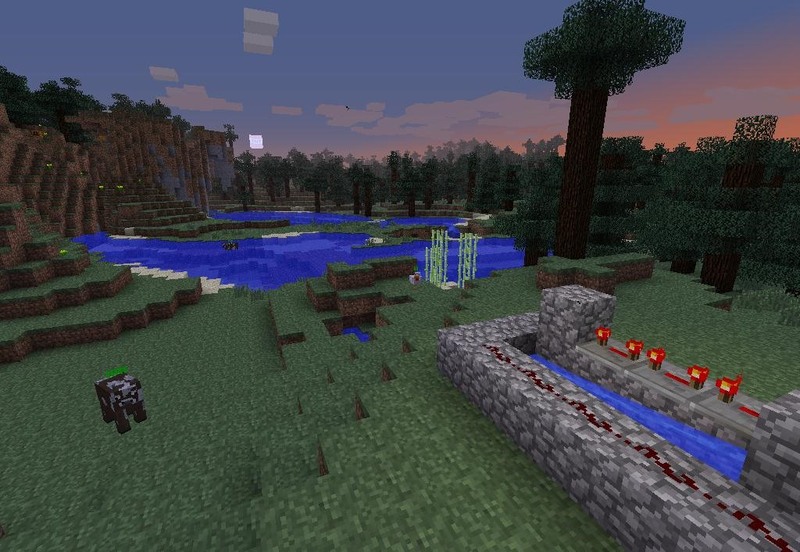 Just think of the multitudinous combinations one can create using redstone, pressure plates, pistons, and even lava! If you have any questions or comments please feel free to leave them below. If you would like to show of your cannons or redstone creations please do so in the corkboard section of our World! Hey thanks for showing my how to do this, It was starting to annoy me lol. Is there anyway to reload or make it fire faster? Oh and can I use this client to do it? search up kiershar's channel on youtube, he has excellent cannons, ranging from undetedectible cannons to infinite use cannons to quick reload cannons, to a space program involving 70+ TNT. You don't need any thing on the side with the redstone torches and reporters. 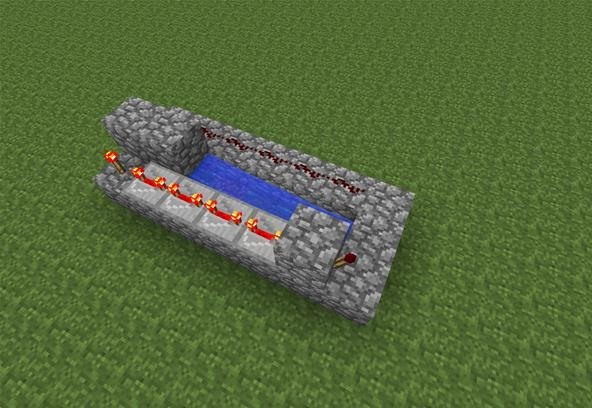 Just use one redstone torch by the tnt at the end (not in the water) after you push the button. Nope, it destroyed my world. I created a tutorial on how to create an 'Auto-Cannon'. Shoots, reloads and fires again and again with a flick of a switch. Updated for 1.5! does anyone know how to make it shoot farther??? Something really weird is happening. I followed the instructions and when I went to fire, somehow the four TNT inside exploded but absolutely nothing else happened. No blocks were destroyed at all except the TNT on the inside. Nothing launched at all either. What even happened? Does it have to be made of stone? I used wool. A TNT launched, but all the others obliterated the cannon. Check Out my guide on How To Make a TNT Cannon! 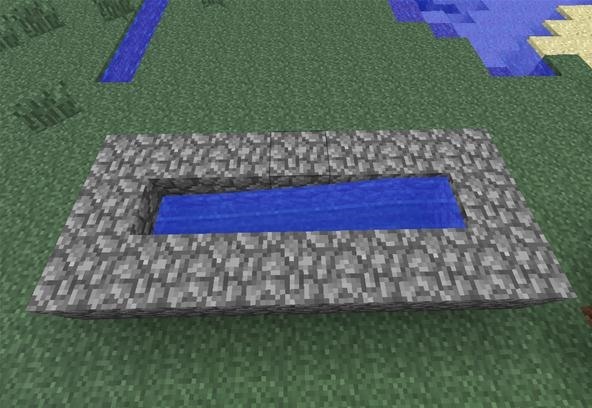 Do I need to use cobblestone? You can use anything. My recommendation, if you have the time, is to use obsidian because it wont blow up if you make a mistake on building the cannon or misplace TNT. OMG. Are you people stupid or what? sorry I'm having a bad day. There is an easier more efficient method using dispensors.